Pacifier Graduation - Joyful Toddlers! 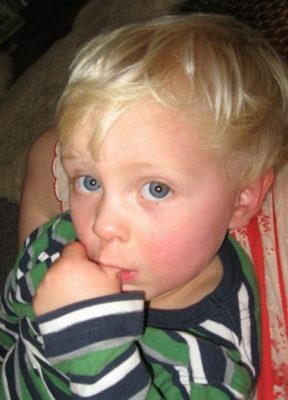 Do you have any tips for weaning a 3 year old from a pacifier habit? My boy is very dependent on his pacifier to help him get to sleep. He simply refuses to go to sleep without it. My husband and I have been thinking that it is time for him to move on. My son has mentioned before that he wants to stop using it, but then when nap time rolls around, he throws a fit and demands that we give it to him. We want him to get his rest, so we end up giving in and letting him have it. Any insight on what to do about this? Hmmmm…..At three years old it seems like you will need to get him on board in some way (as opposed to just ‘losing’ it, for example). One idea is to pick some date coming up in a month or so, and start talking about how he’s going to be done with the pacifier on that date. Create some sort of dramatic ritual to say goodbye to it: perhaps decorating a box together to put it in and bury it, or making a little sail-boat and sending it off down the river to another little boy who’s not big enough to fall asleep without it yet, or something like that. Talk with him quite regularly about it, and tell him that when it’s gone, he’ll still be able to fall asleep even if he misses it. Make the box or the sail-boat together, draw pictures saying goodbye to it, etc. Then when the day comes, make it very formal and special, like a little ‘graduation’ ceremony: say goodbye to the pacifier, have your son do the honors of putting it in its place, and the group of you can fill in the dirt or wave goodbye or whatever. Then have a big celebration for him, with a cake or some special celebratory food. I’m sure he will still be quite sad when bedtime comes and it’s not there, and I’m sure that it will take him some time to figure out how to soothe himself to sleep without it, but bringing this type of ritual may help at least to know that it’s gone for good. What have others of you done to get rid of the pacifier? In Denmark we have ‘pacifire trees’ in almost every park. When you stop using the pacifire, you hang the childs pacifire on the tree, where all the others are, and then you can look at it when you go for at walk in the park. I have not yet tried it, but I sure hope it works, cause my boy is soon 4 and still depending om his pacifire to get him to sleep. I had wanted my 3 yr old daughter to give up using her pacifier for some time when one evening whilst I was settling her she threw it across the room. She had quite a collection and I had gradually been throwing them away and it was the last, and very special one. Anyhow, I looked around but could not find it. However, on her floor I found a golden star. “wow! I said do you know what this means?” and I told her the Pacifier fairy had been and taken it to give to babies and that she would receive a special gift when she woke in the morning. I wrapped a present and left it on her bed to find the next morning… and made sure I found the pacifier and threw it away. When she asked for it I just reminded her where it had gone and she was OK about it. That’s great! I guess ‘losing’ it did work for you guys at age 3, but you combined it with imagination and imagery. And in a way, she also ‘graduated’ as the fairy took it to babies who still needed it. Good thinking on your feet!